From thunderstorm rumblings to dance floor energy; most of us have likely experienced some physical or emotional effects of sound. It's no wonder, then, that artists around the world have been playing with sound to create soundscapes, immersive works, and even shared meditation experiences. Within Phi's virtual reality exhibition Echo: The Sound of Space, experiences like Eliza McNitt's Spheres trilogy—Chorus of the Cosmos, Songs of Spacetime, and Pale Blue Dot—use sound to immerse the visitor. Yet despite their present popularity and global creative trends, artistic sound installations and experiences have long been a significant part of the art, culture, and performance worlds. In fact, sound art is a powerful genre with a rich history. To cite just one example, in 2013, New York’s Museum of Modern Art’s sound art exhibit Soundings, A Contemporary Score featured a selection of sound-related pieces by 16 different artists, including Susan Philipsz, who in 2010, won Tate Britain's Turner Prize. Today, while some sonic installations maximize the high-tech effects of immersive sound, other artistic explorations can feel more lo-fi, primal, and personal in their impact. For instance, group sound meditations like the Amsterdam-based Shift Sound Bath Meditations, by Stacey Griffin, a sound therapy practitioner and meditation instructor, offer public and private sessions. Indicating the trend's popularity, Shift has participated or performed in major events like SXSW. To celebrate the visceral aspects of all types of sound installations and creative experiences, let's discover some perspectives and anecdotes about possible effects of sound that's experienced in a personal or artistic context. Speaking about her personal observations of a general artistic or exploratory context, Dr. Shelley Snow, a psychotherapist, music and sound therapist, has noticed more people seem to be "creating sound environments where the intention is to have a therapeutic effect," she says. "Chambers where people come in and hear mantras playing; sound baths where people come in, lie down, and listen to an hour of everything from gongs to singing bowls to didgeridoos; all this is meant to put people in an altered state and help them to feel better in their bodies and minds." Intention is also important, she adds. "The intention of the artist is key in terms of what people will experience." Snow also points to an aesthetic dimension. "We know that beauty can be very powerful and has a healing effect on people." Yet while Snow certainly feels that different kinds of sound environments may offer therapeutic effects, she points out that it's also very individual. For example, "there is no 'generic healing music' because people have associations to music and sound; for one person it's very healing or therapeutic, and for another, not at all. So, that complexifies what we're talking about in terms of how music and sound affect people." For mental health practitioner Jann Tomaro, who also runs a "serial noise meditation project" at Never Apart, meditation "has led to richer experiences with her senses," she says. "I started to have more conscious awareness of the effects of listening when I was at shows or at home, listening to music, sounds, the noise of life... I was hanging out with Mikael Tobias, a musician and sound artist, and we would often share in listening together. We wanted to explore how sound and listening could impact states of being, so we began the noise meditations. Throughout the noise meditations, I have grown to love the experience of many people connected through sound, resonating in our individuality, together." Rafaelle Mackay is a vocalist, composer, and therapeutic musician who leads workshops and has worked in palliative care. Trained in vocal jazz and Hindu classical music, she also sees strong virtues in vocal improvisation and meditation. "The depth of what vocal improvisation and improvising with other musicians can bring to a person, just being present in the moment and how powerful that is, is one of the beautiful things about music," says Mackay, who first began singing as a shy child as a way to connect to herself and find her confidence. "It's all about being really present with your breath and the sensorial reality of what you're seeing, what you're hearing." When asked to describe in layman's terms how she personally feels music might affect the body, she says that, "If you think of music in vibration, in frequency, different notes are different frequencies and different vibrations. Within that, any sound that you would hear—like a truck going by—somewhere in you, you feel that vibration. My understanding of how sound affects our body is how our body reacts with vibration around us. And when we sing, we create vibration within us. That's what fascinates me about the voice; we have this internal instrument that can produce sound and produce vibration. And, as we can hear and receive sound, we can also create it." 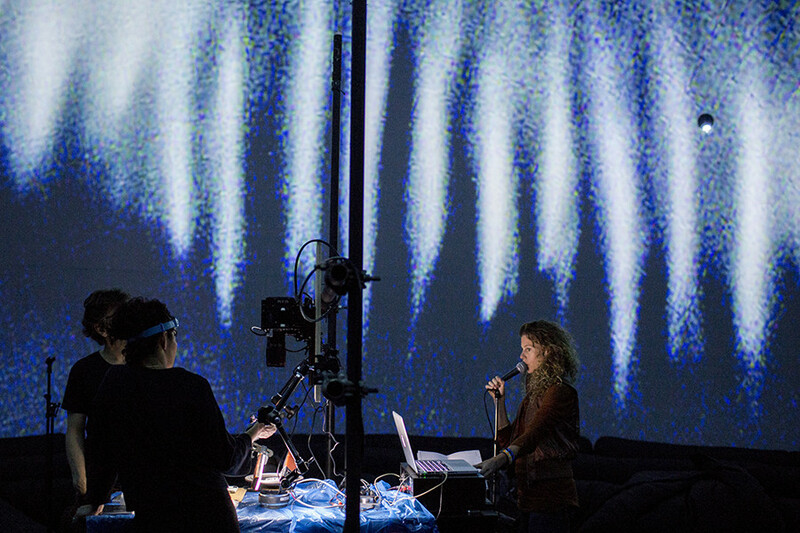 For example, in the recent Société des arts technologiques show Human instrument, on which Mackay and fellow artists Isabella Salas and Patrick Trudeau collaborated in creating, the trio referred to a method called cymatics to artistically explore "how you can see sound," Mackay explains, "to show how different frequencies and notes create different patterns on different matter. We used liquids to show how the human voice, when different singers were singing, affected the water and the patterns that we saw… [So] the sounds we hear, the sounds we make, are affecting us in ways we're not aware of."